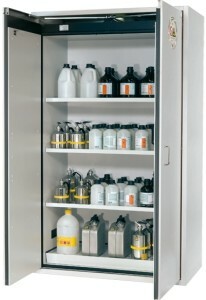 Chemstore are distributors of asecos safety storage cabinets, providing a full range of cabinets for all types of laboratory and industrial applications . This comprehensive range of cabinets are supplied in numerous dimension specification with the aim of guaranteeing your approved storage materials in workrooms. asecos safety storage cabinets comply with the latest European legislation – EN 14470-1. This European Standard is adhered to by many European countries and the U.K. Provision of enough time, in the event of fire, for personnel to leave the room and sufficient time for fire service personnel to enter the building before the stored materials turn a small, fire into an uncontrollable blaze. Contact us today for more information on the asecos range of safety cabinets call 0800 028 2531 or email sales@chemstore.co.uk.